Kiwi Frontline wishes to express sincere condolences to everyone impacted by the extremist terrorist attack on the Muslim community in Christchurch yesterday. Kiwi Frontline has and will continue to advocate for racial equality, democracy and one law for all to maintain peace and security in our country. Extremism, violence and hate are condemned and not the way to achieve this. The Auckland Plan 2050 is currently open for feedback from the public. But time is running out - THE DEADLINE IS 28th March. Of particular concern for us at Democracy Action is one of the six objectives of the Auckland Plan, (the Plan), which provides one class of citizens, defined as ‘Mana Whenua’, with substantial powers over Auckland’s resources. One of the key directions of the Plan is to enhance the authority of Mana whenua and Mataawaka, as Treaty partners, with Māori actively involved in decision-making and management of natural resources. This includes an increase in the number of co-governance arrangements. The strategic use of the Treaty is being used to undermine democracy. As Auckland Council’s commitment to honouring the Treaty, the citizens of Auckland are being required to recognise mana whenua as rangatira* in Tāmaki Makaurau. In effect the council is surrendering council authority, and our democracy, by giving a non-elected group of citizens political power over and above others. This is the exact opposite of what the Treaty promised, i.e. that all are to be entitled to the same rights - no more, and no less. (*Rangatira: chief, chieftain, master, mistress, boss, supervisor, employer, landlord, owner, proprietor). The Plan’s ‘Māori identity and wellbeing outcome’ strategy promotes “the advancement of mana whenua leadership and decision-making, in partnership with council, and seeks to increase the number of co governance arrangements”. * “Co-governance arrangements between Māori and the council, or iwi and the Crown, allow for a more direct influence and greater exercise of authority by mana whenua over the taiao (natural resources). In 2017 there were eight co-governance and co-management arrangements between Auckland Council and Māori in Tāmaki Makaurau. The number of sites that involve Māori in governance roles will grow”. (The Auckland Plan Evidence Report - Māori Identity and Wellbeing reveals that the council has a target of 16 shared-governance-with-iwi arrangements to be in place by 2040. [See Target 2, Figure 4]). * “Auckland Council works with mana whenua and mataawaka, with guidance and support from the Independent Māori Statutory Board, to enable Māori to be involved in decision-making processes. Mana whenua are involved in the consenting process and input into a range of other resource management activities”. * Recognising mana whenua as rangatira in Tāmaki Makaurau honours our commitment to the Treaty and provides a pathway towards a future-focused dynamic, successful Auckland. * “Te Tiriti outcomes for hapū and iwi also mean acknowledging and recognising them as rangatira in Tāmaki Makaurau, and their important relationship to the whenua”. Click here for a link to the ‘Maori Identity and Well-being’ section of the Plan. WHAT IS THE AUCKLAND PLAN 2050? The public have been given just 30 days to have their say - the deadline is 8pm on 28th March. * By post. If you want to provide feedback via mail, call the council on 09 301 0101 and request a free-post feedback form. * Consultation documents and feedback forms are available at libraries, local board offices and service centres across the region. * Tweet @AklCouncil and include the hashtag #akhaveyoursay and your comments will be recorded as feedback. * Posts on Auckland Council's Facebook page using the #akhaveyoursay hashtag will also be counted as feedback. Need help with what to say in your feedback to Auckland Council? Please click here for a list of ideas. “We are committed to leading in the development of a successful democratic partnership model in Local Government. This is why the Māori Plan* is so important to us. It is a tool that we will use to assist us to prioritise and make the most of the opportunities to advocate to council for partnership and resourcing of Māori outcomes”. If you need more help, or have any queries, please contact us at democracyaction@xtra.co.nz. The following is a template letter/email that New Zealand citizens can use to oppose the forcing of race-based wards, please take the opportunity (Copy & Paste) and send it to MPs. 1] It is born out of a dictatorial and racist ideology. 2] It ignores the egalitarian wishes of “the people”. 3] It is condescending towards all those of Maori descent. 4] It disregards healthy human psychology. 5] It ignores the facts. As MP Ron Mark said in his speech in Parliament (28/6/17), this approach presupposes that all those with any Maori blood are the same and think alike. It also presupposes they are incapable of achieving on their own merits or abilities. Well, we all know that that is simply not true. We are surrounded by people of Maori descent who have shown they have the attitude, ability and fortitude to have a good and successful life without race-based laws greasing their paths. None of them have relied on racist policies. Ron Mark rightly says that any discussion about Maori representation would need to start with the question “which Maori”? As a New Zealander with Maori blood, the ex-mayor of Carterton (2 terms) and a long-standing MP, he is living proof that we don’t need apartheid in local government or anywhere else. Marama Davidson is very good at twisting semantics to imply she is doing God’s work, but her ideology only serves a power-hungry elite. It does nothing to help ordinary people struggling with everyday challenges. So please think of all New Zealanders and ignore the calls for legalising racism. Ensuring equal rights is the job of government. It is then up to us, our families and society to work for good outcomes. But in the interest of having as many groups as possible opposing all of the claims, I (Muriel Newman) have just managed to convince a landowners’ advocacy group to expand their appeal from the 14 or so claims that cover their district, to the 200 claims that cover the whole country. AUCKLAND COUNCIL ARE ASKING THEIR SUPPLIERS TENDERING FOR WORK IF THEY ARE A MAORI BUSINESS!!! * are aligned with The Treaty of Waitangi (Te Tiriti o Waitangi) in both spirit and form. Create an account in SAP Ariba and complete the online profile. This is required to be completed by all companies/businesses seeking to engage with Auckland Council’s new procurement plan, and review and respond to Auckland Council tenders. 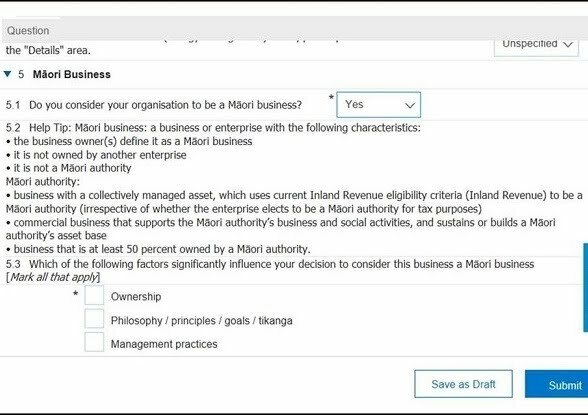 It requests standard information regarding compliance certification, insurance information, details of services provided, annual turnover, number of employees etc AND WHETHER YOUR BUSINESS IS CONSIDERED TO BE A “MAORI BUSINESS”. Do you support the democratic principle that government should treat all citizens equally in law, irrespective of ethnicity? A yes or no answer would be appreciated. Do you support tribal elite claims to own, control, allocate or tax fresh water? Do you support Maori groups making customary claims to New Zealand’s entire coastline? National’s 2011 legislation has resulted in approximately 580 claims this year, covering every centimetre of New Zealand’s coastline, including the very busy Waitemata and Manukau Harbours and the Hauraki Gulf. The government-appointed Education Council now requires Teachers to “demonstrate and model their commitment to a bicultural partnership”, “affirm Maori learners as tangata whenua, “practice and develop the use of te reo”, “design and plan approaches which reflect the bicultural partnership in Aotearoa New Zealand”, demonstrate respect for Maori beliefs, language, culture and customary protocols and affirm the “Maori world view”. How is it then that there’s been no trickle down to everyday Maori and no improvement in all the often-quoted social statistics? There are currently 25 Members of Parliament with Māori blood. 18 were elected on the General Roll and adequately represent the Maori portion of the population. So do you support or oppose the extra, race-based Māori seats and the Māori electoral roll? Please feel free to use asking candidates or to share with your contacts. ....We have been looking into Marine and Coastal Area claims and found that THE ONLY ONE TO BE RESOLVED IN THE HIGH COURT HAD NO GROUPS OPPOSING IT – only the Attorney General. THE JUDGE FOUND IN FAVOUR OF THE APPLICANTS. As a result, we have been working hard to ensure that all of the 100-plus High Court claims that have been advertised in newspapers will be opposed by fishing and recreation groups. However, while claimants have access to millions of dollars of financial assistance, those objecting to the claims have to pay $110 for each one they oppose. Accordingly, WE ARE NOW LAUNCHING A FUNDRAISER to help these fishing and recreation groups cover the tens of thousands of dollars in Court application fees and other costs that they are incurring on behalf of the New Zealand public. And please be generous, because the task these groups have taken on - in the public interest - is not an easy one. Thank you for your interest - and support. THE FORESHORE AND SEABED CLAIMS DEBACLE: BIGGER THAN BEN HUR? Applicants for Customary Marine Title and/or Protected Customary Rights can choose to either negotiate their claim with the Crown, OR file the claim in court. A list of claims which have registered for direct engagement with the Crown is viewable online here: http://tinyurl.com/mxjoefy We understand this list will be added to once details of further applications have been confirmed. The High Court process is a little more complex. It is explained on this flow chart here > http://tinyurl.com/mq3ulcd however, information regarding specific applications in the High Court must be requested from the Court by writing to the Court registry or using this form here: http://tinyurl.com/mq4w9q8 (no one said it would be easy!). Neither is an exhaustive list, but contain information available at the time of their publication. Please keep a watch for further claims published in the public notices columns of your local newspapers. “In the Marine and Coastal Area Act, the main type of privatised title is called a Customary Marine Title. To qualify, a tribal group must show that it has “exclusively used and occupied the coastal area from 1840 to the present day, without substantial interruption”. WHAT CAN WE DO ABOUT THE MARINE AND COASTAL AREA CLAIMS? While there is no opportunity for the general public to become directly involved in negotiations between the Crown and the applicant groups, we can be involved as interested parties in any application filed in the High Court. Our courts depend on an adversarial process – they are very poorly equipped to test claims and evidence when there is no adversary. Democracy Action has considered filing notices of appearance on each claim, initially as placeholders. This would preserve a right to challenge or to test. However, this process, on such a large scale, is far beyond our financial resources. You may want to file an individual objection to a claim in your local area though. Anyone who plans to object to any claims needs to register their intention with the Court without delay. Any interested person may appear and be heard on an application for a recognition order if that person has, by the due date, filed a notice of appearance. We suggest you single out an application (or applications), particularly the coastal areas you know from experience have not been exclusively used and occupied by the applicant from 1840 to the present day, and register as an interested party in the case. Each public notice will tell you what the final date for filing a notice of appearance is. We have been advised by the Court Manager and Registrar of the High Court in Wellington (where the applications to the High Court have been filed), that interested parties will not have to travel to Wellington. Although they are currently managing all of the files there, substantive hearings will be held in the High Court closest to the land subject to the claim. In addition to encouraging family, friends, and colleagues to take action by forwarding this email, you may want to approach other potential interested parties. For example, you could target a specific claim, and approach organisations which have an interest in that particular marine and coastal area, suggesting they register as an interested party. For instance, regarding the HAURAKI GULF, there are at least 8 claims for west Hauraki Gulf alone, (CIV -404-537; CIV-2017-485-378; CIV-404-538; CIV-485-276; CIV-404-563; CIV-2017-404-545; CIV-2017-404-524), and more for the northern Gulf (Kawau Is etc), plus others in Coromandel and Firth of Thames areas. There are many organisations in this area who would be affected, e.g. fishing and boating clubs, port companies, marinas etc. You could make sure the groups in your local area have a heads-up on the claims. Or send a cheque to PO Box 1876, Wellington 6140, made out to CORANZ 26 Account. PHONE, WRITE OR EMAIL the Prime Minister, and your local MP, demanding the Crown defend the rights and interests of all the citizens of New Zealand by vigorously challenging and testing the claims. WRITE LETTERS to local newspapers, call talkback. DESPITE THE SOOTHING WORDS OF THE PRIME MINISTER THAT “only a handful of claims would meet the criteria”, and from Minister for Treaty Negotiations, Chris Finlayson, that “most of the claims were likely to fade away”, and as if the glittering prize of title to and control of our marine and coastal area was not enough inducement, the Government is further incentivising the claims process. The Office of Treaty settlements is providing substantial funding to claimant groups - funding for costs related to legal, historian and project management tasks that contribute to determining whether the application meets the tests under the Act. According to Government guidelines ( here: http://tinyurl.com/lj2zmrz ) funding this is expected to range from $162,000 - $412,000 for each claimant group who chooses to engage with the Crown. An added incentive for making a claim is that, whether the applicant group has any likelihood of success or not, while the process is taking place those seeking resource consents, permits or approvals in the common marine and coastal area must notify and consult any group that has applied for recognition of customary marine title in the area. This whole fiasco was created by the National Government in cahoots with the Maori Party. Concessions made to the Maori Party by the Government are being abused by those who have adopted the extremist position that Maori have a permanent underlying ownership of the marine and coastal area. This is having a corrosive effect on race relations, and is creating a situation many who opposed the Marine and Coastal Area Act feared would happen. We must call our politicians to account for this disastrous law. Later this year we have the opportunity to vote for a party that promises to bring about the repeal of the Act.